Yoshi Sudarso portrays an Indonesian American who returns to Indonesia years after his father's killing.Courtesy of Infinite Frameworks Pte Ltd.
LOS ANGELES — Yoshi Sudarso got his first job as an entertainer right out of college, playing a cowboy in the “Wild West Stunt Show” at Knott’s Berry Farm, an amusement park in Orange County, California. During his two years there, he rotated through all of the show's main characters, he recalled, playing everything from the goofy comedic lead to the burly lackey and the aloof general — all while doing fight choreography, high falls, and classic gunslinging moves like spinning a revolver in and out of his holsters. Sudarso, who is perhaps best known in the States for his role as Koda, the Blue Ranger on “Power Rangers: Dino Charge,” remembers the reactions he used to get from other Asian Americans. Yoshi Sudarso as Suwo in "Buffalo Boys." The actor has been attempting to develop an Asian-American western for years.Courtesy of Infinite Frameworks Pte Ltd. Cowboy culture in North America started with Spanish colonialists and Native American ranch hands in the early 16th century, a 2016 news report by The Atlantic examining the white washing of the Old West noted. After slaves were brought over in the 1800s, African American cowboys were common, and around the same time, there were 20,000 Chinese immigrants in the West contributing to building the first Transcontinental Railroad. But the Asian-American cowboy has been elusive. Westerns are such a big part of American culture. But as Asian Americans, we never see ourselves in them. Director Antoine Fuqua’s Denzel Washington-led 2016 adaptation of the 1960 western “The Magnificent Seven” (itself a re-telling of Akira Kurosawa’s “Seven Samurai” from 1954), started a conversation dispelling the myth that the Old West's cowboys were solely white. So after Sudarso left the “Wild West Stunt Show” and booked the Power Rangers role in 2015, he wanted to develop an Asian-American western, but the projects didn’t go anywhere. Ironically, he had to go back to Indonesia, the country he was born in before immigrating to America at age 9, to finally play an Asian American cowboy on the big screen. 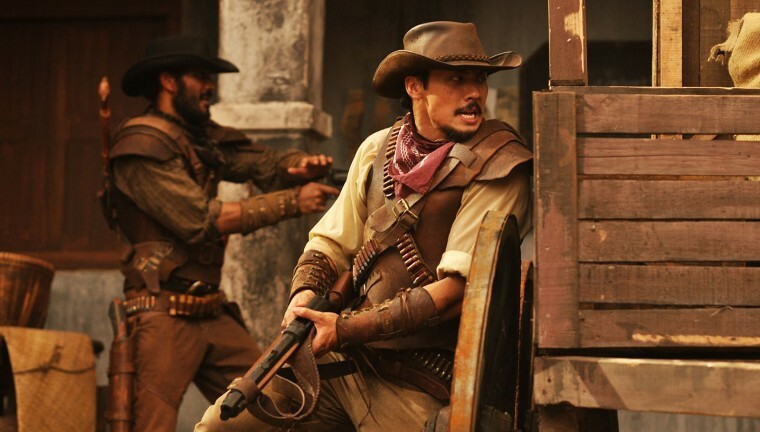 “Buffalo Boys,” directed by Mike Wiluan, opened in Indonesian theaters last week. Wiluan, who is the CEO of Infinite Studios film studio, called his directorial debut a “nasi goreng western,” referencing the Indonesian fried rice dish. The story is set in Java in the late 18th century during the Dutch occupation of Indonesia. Two Indonesian-American brothers, Jamar (Ario Bayu) and Suwo (Sudarso) have been raised by their uncle in California ever since their father’s death when they were kids. They return to Indonesia and find that decades later, their town’s people have been enslaved by their father’s murderer. Though “Buffalo Boys” is an Indonesian film, the cast and crew include those who were born or grew up abroad. Wiluan is a Singapore-based Indonesian filmmaker who lived in England starting when he was 8 through college. Ario Bayu, who sports an American accent in the film, is an Indonesian-born actor who was raised in New Zealand before returning to Indonesia as a young adult to pursue his acting career. Ario Bayu and Yoshi Sudarso in "Buffalo Boys"Courtesy of Infinite Frameworks Pte Ltd. Accepting the role of “Buffalo Boys” ended up being a turning point for his career. At the time, Sudarso, who had always been doing stunt work alongside his acting work, had been working behind the scenes doing stunt choreography for a big franchise film — a gig he believes could have resulted in steady work for the next eight years. When he was offered the role of Suwo, his employers told him that if he left for Indonesia for three months to shoot a film, they unfortunately couldn’t guarantee that the stunt choreography job would still be open when he got back, but it was a decision Sudarso felt was worthwhile.